Liberty Township residents opposed to a proposal by the Delaware County Engineer’s Office to temporarily open a connection between Manning Parkway and Loch Lomond Drive to alleviate traffic during the Liberty and Jewett roads roundabout project this summer spoke out during Monday’s Liberty Township Board of Trustees meeting. Their fear is once the connection is open, it will never close again. 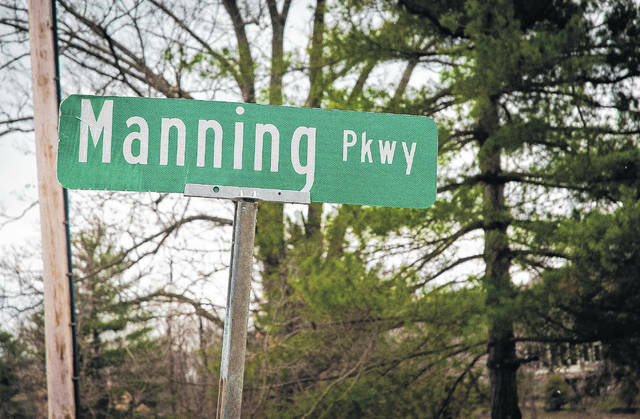 Residents of Liberty Township voiced concerns to trustees Monday in regard to a proposal by the Delaware County Engineer’s Office to open a connection between Manning Parkway and Loch Lomond Drive to alleviate traffic during the Liberty and Jewett roads roundabout project this summer. Becca Mount, resident of Calumet Farms, said the end game of the county engineer has all along been to get the connection built. Matt Huffman, township administrator, invited a member of the Delaware County Engineer’s Office to bring the township residents up to date on the Liberty Road and Jewett Road intersection roundabout project scheduled to begin this summer. Doug Riedel, senior project engineer, said the engineer’s office anticipates closing the road around the last week of May or the first week in June. However, the time frame is contingent upon the weather and the utility companies getting their facilities moved. In February 2107, the engineer’s office held an open house to get feedback from residents on the construction of a $1.5 million single-lane roundabout. According to Rob Riley, chief deputy engineer, the county received $490,000 from the Ohio Public Works Commission to help fund the project. Riley also said that traffic studies showed the volume of traffic to be “about 10,000 vehicles a day on Liberty Road and 4,500 on Jewett Road. Information detailed in a handout from the engineer’s office predicts that the the daily traffic will increase 60 percent by the year 2036 for the intersection. Currently, the intersection is a three-way stop that becomes congested between the hours of 4 to 6 p.m. on weekdays. According to Huffman, Jewett Road will close first, 30 days ahead of Liberty Road, for the first phase of the project. Once the phase is completed, both Jewett and Liberty roads will be closed for the remaining length of the project. Huffman said the Ohio Department of Transportation, City of Powell, and Liberty Township met to discuss access to Jewett Road from state Route 315. The roundabout project will create access issues during peak traffic hours to and from the neighborhoods that reside between state Route 315, Jewett Road and the railroad tracks. Reidel said one of the options included in the discussions is to pay an off duty officer to direct traffic during peak hours, but he also offered the second option of opening Manning Parkway. Reidel said the engineer’s office saw merit in the option but without data, could not definitively tell how much it would improve the traffic problem. Trustee Shyra Eichhorn said she didn’t live in the area but did travel through there often and was concerned about the narrow widths of the roads. Eichhorn said that she is one of two trustees currently on the board that gave their word not to open Manning Parkway. “I would never be in favor of moving to open that road without definite closure after construction because we need traffic relief,” said Trustee Mike Gemperline. Trustees didn’t take any action on the matter Monday, but tabled it until the next trustee meeting at 7 p.m. Monday, May 7, at the township hall, 7761 Liberty Road. Trustee Melanie Leneghan was not present at the Monday meeting. For further information about the project, go to delgazette.com and click on the links in the article. This entry was tagged D. Anthony Botkin, Eichhorn, Gemperline, Liberty Township, Mount, Riedel. Bookmark the permalink.